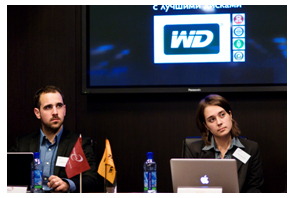 10/29/2012- Thecus® and its Russian distributor Tayle held a successful press conference on October 24 in Moscow, Russia. The company announced several new models and demonstrated their most interesting characteristics. As a co-marketing effort, Western Digital also attended the event and gave a presentation about their new Red drives designed especially to work with network attached storage devices. The conference started with a welcoming coffee break after which Tayle's CEO Igor Belousov greeted the guests and spoke about Thecus® and Tayle's association. The official relationship started 5 years ago in 2007, when Tayle became Thecus's 1st distributor in Russia. With 21 fully equipped offices, warehouses and countless partners throughout Russia, Thecus® is proud to have Tayle as their main distributor. Following Tayle's presentation, the stage was taken by Thecus's team, Andy Liu, Jonathan Geoffroy and Olga Shipilo who talked about Thecus's strong connection with Tayle, stressed the importance of the cooperation between Intel and Thecus and lastly, described the most recent products and software innovations brought by Thecus® to the NAS industry. Among the newly announced devices, the audience was introduced to the N4510U/R, the N7510, the N4800Eco, and the DAS D16000. 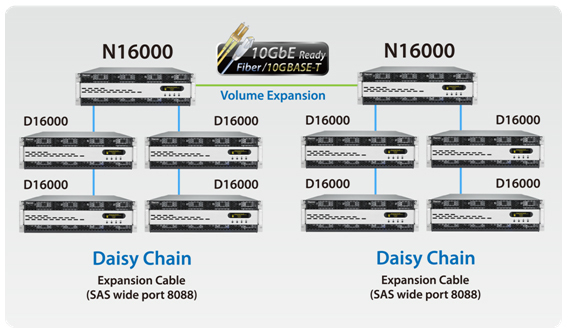 The D16000, especially designed for daisy chaining expansion, can help the users to achieve up to 2.5 PB of storage space! Also part of the show, the guests were offered to see and try Thecus's latest new devices which are part of the Vision series, including the N4510U, the N7510 and set-up as a live demo, the N5550. All three devices utilizes a powerful Intel® Atom™ processor, have substantial DDR3 memory, superfast USB 3.0, and are all equipped with an HDMI output. Paired with the Local Display module, these NAS will give the users a whole new multimedia experience. As for software innovations, Thecus® presented its new firmware, the ThecusOS 5.0, which includes brand new features like volume expansion via 10GbE and daisy chaining, High Availability (HA) function, a complete local and remote backup solution with Data Guard and a reliable antivirus solution with McAfee. Another great innovation presented by Thecus® at the press event is the Local Display module, which allows the users to connect their NAS directly to an HDTV via the HDMI output and gives them the ability to play multimedia files, get access to the NAS UI, Internet browser, and Terminal for developers without the use of a computer! During her presentation, Olga Shipilo also pointed the fact that all Thecus® NAS now come with the antivirus protection provided by McAfee. The reason why Thecus decided to partner with this particular company is explained by its leadership, its ability to scan large files, a 99% virus detection rate and its fast scanning speed. As a guess to this event, Oleg Leontjev from Western Digital took the floor and spoke about WD's Red drives designed especially to work in NAS environment. He went into details about how they work and the reasons why they should be preferred by NAS users. Lastly, before sharing lunch together and to close the presentation session, everyone got a chance to take part in a giveaway activity. Our congratulation goes to Maria from PcMag who won the main prize, a Thecus N2800 NAS equipped with 2-1TB WD Red hard drives.